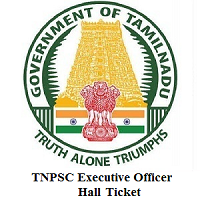 TNPSC Executive Officer Hall Ticket 2019 Is Out..!!! The officials of the Tamil Nadu Public Service Commission (TNPSC) had released the TNPSC Executive Officer Admit Card 2019 for the Executive Officer Grade III, Executive Officer Grade IV Written Examination on 12th February 2019. And all the eligible participants can only download it online from the official site @ tnpsc.gov.in. Moreover, the scheduled TNPSC Executive Officer Exam Date 2019 is 16th, 17th February 2019. So, candidates before going to attend the test, you should collect your tnpsc.gov.in EO Hall Ticket 2019. Furthermore, in the upcoming sections, you can find the latest TNPSC Executive Officer Selection Process 2019 along with the steps to download it, the direct link to get your தமிழ்நாடு பொது சேவை ஆணையம் Admit Card 2019 from the official site. And the Link Is Available Now, so click on the link provided below. Selection will be made in two successive stages. Moreover, the final selection will be made on the basis of the total marks obtained by the applicants at the Written Examination and Oral Test has taken together subject to the rule of reservation of appointments. Applicant’s appearance in the Written Examination and Oral Test is compulsory. An applicant who has not appeared in any one of the papers in Written Examination or the Oral Test will not be considered for selection, even if he/she secures qualifying marks for the TNPSC Executive Officer Selection Process. www.tnpsc.gov.in or www.tnpscexams.net or www.tnpscexams.in for downloading by applicants. Hall Tickets will not be sent by post. Hence, applicants should watch the TNPSC website before the scheduled date of examination. Remember, that you have to get your Registered Application Number, Date of Birth or Password to access the login page to download the தமிழ்நாடு பொது சேவை ஆணையம் Admit Card 2019. And the officials of the Tamil Nadu Public Service Commission are ready to conduct the Executive Officer Grade III, Executive Officer Grade IV test on 16th, 17th February 2019. Follow the steps to download your TNPSC Admit Card 2019 without any issues. Initially, all the candidates need to attend the official site of the Tamil Nadu Public Service Commission @ tnpsc.gov.in. Scroll down to the home page and then observe the Notifications section. In that click on the latest notifications link. Observe the left side of the page and then click on Online Services button. Then, you can easily find out the Hall Ticket Download tab. Click it and then scroll down to the page to get your TNPSC EO Admit Card 2019. Soon, after referring to the flashed link tagged as ADVT 32/2018, 31/2018, then all you need to click it. Now, enter your Application No. (OR) Login Id or date of birth to access the login page. Then submit the page by once correcting your credentials. Therefore, your valid TNPSC Executive Officer Hall Ticket 2019 appears on the screen. Save it and also download it. Now, take 2-3 copies of the downloaded TNPSC Executive Officer Admit Card 2019 for further reference. Candidates can leave a comment in the below section of our FreshersNow page for any updates regarding the TNPSC Executive Officer Hall Ticket 2019. So, bookmark us by Ctrl + D to get the exciting alerts.